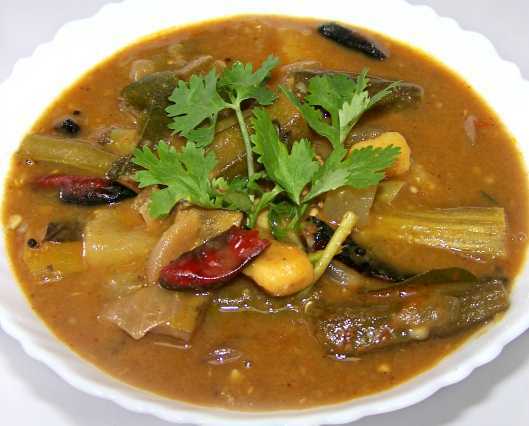 Wash the dal thoroughly and cook it with beans, brinjal, potaro, drumstick, cucumber and ash gourd in a pressure cooker by adding enough water, salt and turmeric powder for 2 whistles. Heat one table spoon oil in a frying pan; throw the onion, chopped ladies finger, Shallots followed by tomato and sauté till it become soft. Cook covered on low flame until the vegetables are done. In between soak tamarind in warm water and then extract the juice from it. Now add the tamarind juice to cooked dal vegetable mixtures; stir and cook on low flame for some more time, adjust the salt level. When the vegetables are cooked add the sauteed shallots- ladies finger mixture to the dal and mix well. Sprinkle asafoetida powder and bring to boil. Mix in the sambar powder, coriander powder and chilli powder and sauté for couple of minutes on low flame. Meanwhile heat oil in a pan, add the mustard seeds and allow it to splutter, throw the dried red chillies and half of the curry leaves and fry for a minute. Pour this seasoning to the sambar sambar mix well for a few minutes. Remove from flame and sprinkle chopped coriander leaves and remaining curry leaves. Mix the curry well before serving.